In his essay “My President Was Black,” Ta-Nehisi Coates challenges President Obama’s approach to addressing race relations in the US, speaking to his “embrace of white innocence” as a means for political survival. He cites the examples of Obama’s objection to the arrest of Henry Louis Gates Jr. in 2009, his comments on the the tragic murder of Trayvon Martin -- “If I had a son, he’d look like Trayvon” --and the disapproval that Obama faced because of them. He was able to navigate the color line with the utmost poise and precision, but was never able to pledge allegiance to his blackness, for fear of political suicide. Many pundits and voters alike assumed that, because the country that came together to elect a multiracial President, we had transcended our racial divides. And yet, it was that same post-racial delusion that meant it would never be okay for President Obama to address to the racially-tense reality in which we still live. Fast forward three years after his administration, and the world is even further from that supposed post-racial society that elected him. With the 2020 presidential race in sight, the question then becomes: would we “transcend” race by electing another person of color to the White House and fail once again to address it? Furthermore, could we even go so far as to elect a woman of color? When Kamala Harris announced her candidacy for the 2020 presidential election on Martin Luther King Day, FiveThirtyEight ranked her as having the highest potential to beat Trump. 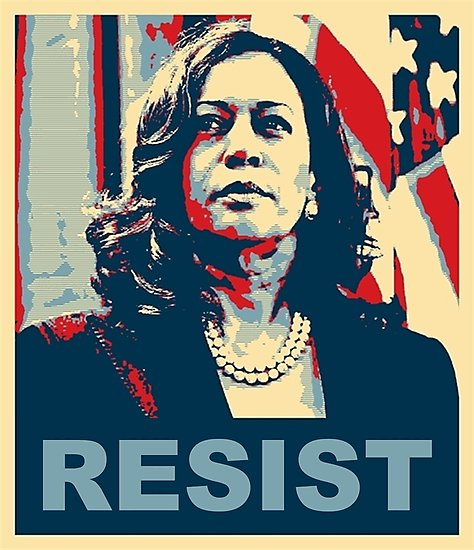 Kamala Harris’ announcement is the only one I’ve been anxiously awaiting this cycle. The first-term California senator almost exactly mirrors my racial and ethnic makeup. Obama showed me that a mixed half-black, half-white man could be president of the United States; I believed anything was possible. Then this country elected Trump to the White House over even a white woman, and I was faced with the reality that maybe I didn't have all the options I thought I had. But if Kamala were elected, it would show me that someone exactly like me could hold the highest office in the nation; the announcement of her candidacy likely felt to me how white supremacists felt when Donald Trump announced his. Obama was the country’s first black president, meaning everything he navigated came with the additional complication of race, starting from the moment he moved into a house built by slaves. If Harris were to be elected, she would be tasked with the responsibility of not only healing a more visibly divided nation in a post-Trump America, but addressing race in ways that Obama never could as America’s ‘first.’ However, questions about her capability to take on such a responsibility arise in light of Harris’ complicated record on policies upholding mass incarceration of black and brown people and police brutality. Her record both as a California district attorney and as the state’s attorney general have left a pattern of controversial decisions that undermine her self-identification as a “progressive prosecutor.” For example, she opposed a bill in 2015 that would require her office to investigate shootings involving police officers and refused to state-sanction body cameras on police. Furthermore, Harris has a troubling record with wrongful conviction cases, often upholding convictions where prosecutors unlawfully withheld information or racism and corruption worked hand in hand. Her track record is especially problematic considering that it is in these positions that Kamala Harris had the greatest potential agency to bring justice to a notably unjust system. However, when we analyze Presidential Candidate Kamala Harris, we do not need to necessarily conflate her with Attorney General Kamala Harris. In the past, district attorneys claiming to be “tough on crime” have been more successful in getting elected. It is only in recent years that there has been a significant shift in criminal justice politics. David Sklansky, an expert on prosecutorial powers at Stanford Law School, says of district attorney races in the past, “to the extent that they focused on policy, they competed on who could issue the harshest punishment.” It is only now that DAs are “being defeated in a lot of races where there’s a focus on policy. And the policy that’s winning is not ‘Let’s get tougher,’ but ‘Let’s get fairer. '” It is possible that Americans have witnessed what being “tough on crime” actually means for people of color or they have grown frustrated with politicians running without concrete policy. Furthermore, we must consider how her race has impacted the amount of choices she has had. Being a Democratic person of color means you are held to the double standard of having to make sacrifices for the sake of bipartisanship while also navigating the color line. For example, Obama’s high numbers of deportation throughout his presidency strained relationships with immigration activists, all so Republicans like Rep. Lamar Smith could reprimand him for his policy of “backdoor amnesty.” Of course, his decisions regarding immigration remain problematic, but simultaneously, the double standard as a result of his race must be reconciled in order to grasp the severity of every choice Obama had to make. We must equally contextualize Kamala’s record with criminal justice and grant her the benefit of the doubt, while also holding her accountable for her past actions. We cannot afford to run the same risks we did in the 2016 election and write off candidates without comprehensively scrutinizing their past as well as their comments for the future. Her first step in winning over POC communities will be to acknowledge her part in upholding racially unjust systems. Then she must put forth policies that would to counteract the very systems she was required to be complicit in as district attorney and attorney general. It is only then that she can not only be “For the People,” but first and foremost, for her own, in ways that Obama never could. Mar 21 The Staunch Cuban Republican: A Thing of the Past?